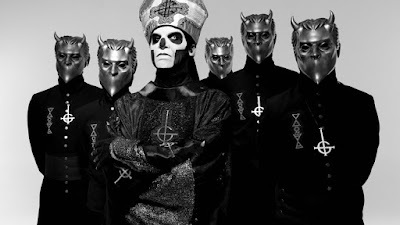 Swedish rockers Ghost have announced a series of US headline dates during this summer’s North American tour with Iron Maiden. Pre-sale tickets for the Ghost headlining dates are on sale now with general public seats available March 31 at 10:00 a.m. local time. Last month, the group won the "Best Hard Rock/Metal" category at the Swedish Grammis Awards in Stockholm for “Popestar”, ahead of fellow nominees Amaranthe, Cult Of Luna & Julie Christmas, Dark Tranquillity and In Flames. Under the leadership of Papa Emeritus III, Ghost debuted its new lineup of Nameless Ghouls at the launch of a spring European tour in Norwich, UK on March 24.